What is 'carbon neutrality' – and how can we achieve it by 2050? "Achieving carbon neutrality by 2050 requires unprecedented political will and cooperation – but it's not impossible." Climate policy expert Farhana Yamin explains what becoming 'carbon neutral' means and how we can make it happen. Elders team: What does 'carbon neutrality' mean? Farhana Yamin: Many individuals, companies and countries around the world have made a commitment to being carbon neutral. This means taking action to reduce their greenhouse gas emissions to zero – and then ‘offsetting’ an equivalent amount of any remaining emissons. An attractive aspect of carbon neutrality is that it is easy to understand and allows everybody, from a country right down to a business or an individual, to be part of the solution to climate change. And there is no need to wait for national or international legislation before becoming carbon neutral – although, as a lawyer, I have to say that laws can help by creating incentives and improving transparency (see the IDDRI article Possible Elements of a 2015 Legal Agreement on Climate Change). The Elders’ call to world leaders to achieve carbon neutrality by 2050 is very timely. The intensive preparations by governments, civil society and business leaders to negotiate a new global legal agreement on climate for adoption in Paris in 2015 need the widest possible basis of support. Achieving carbon neutrality by 2050 is ambitious but consistent with what climate scientists are saying: we need to peak global emissions by around 2020 and reduce them to net zero by around mid-century to have a good chance of staying below the globally agreed limit of a 2º Celsius rise in global temperatures. Any higher and the impacts are devastating, especially for the poor and most vulnerable who have contributed little to global warming and stand to lose the most. How is carbon neutrality different to ‘net zero emissions’? The terms ‘net zero emissions’ and ‘carbon neutrality’ are interchangeable. The core meaning of both is the need to achieve ecological balance between activities that emit climate pollution and processes that reduce the impact of that pollution to zero or close to zero. Both terms mean a phase out of fossil fuel emissions accompanied by a phase in of energy efficiency and renewable energy complemented by measures to bring down emissions from agriculture and forestry so as to achieve overall ecological balance. Is carbon neutrality a goal enshrined in the international negotiations on climate change? The term ‘carbon neutrality’ did not exist back in 1992 when the UN Convention on Climate Change (UNFCCC) was agreed. Nevertheless the idea of balancing carbon sources and sinks is embedded in Article 2 of the UNFCCC, so you could say that carbon neutrality is part of the DNA of the Convention! Article 2 requires its 195 parties to achieve “stabilisation of greenhouse gas concentrations in the atmosphere at a level that would prevent dangerous anthropogenic interference with the climate system.” This cannot occur without phasing out greenhouse gas emissions. More recent developments reaffirm this line of thinking. In 2010, parties agreed the goal of not allowing global temperatures to exceed 2º Celsius above pre-industrial levels. This means ensuring that global emissions peak as soon as possible and then decline to net zero around 2050. As a result of the latest report of the Intergovernmental Panel on Climate Change (IPCC), some countries want the goal of carbon neutrality by 2050 more explicitly included in the global agreement being negotiated for adoption in Paris in 2015. 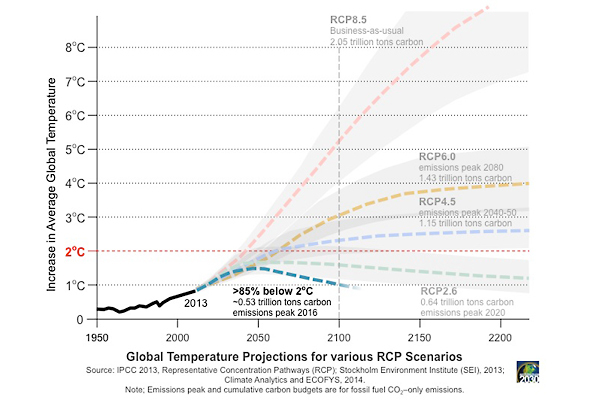 They argue that to avoid exceeding a 2º Celsius rise, we have to set out the trajectory for achieving zero global emissions by 2050. Can carbon neutrality be achieved by mid-century? The IPCC report clearly shows that we need to limit carbon emissions to around one trillion tonnes (see the The Trillion Tonne Communiqué). Around half of this has been emitted already. At current rates, we will have passed the one trillion cap in around 30 years. This means the transition to a virtually zero-emissions economy has to start now and be substantially in place by mid-century. This timeframe is very ambitious but technically feasible. It would require an unprecedented level of political will and cooperation – but something that is unprecedented is not the same as something that is impossible. 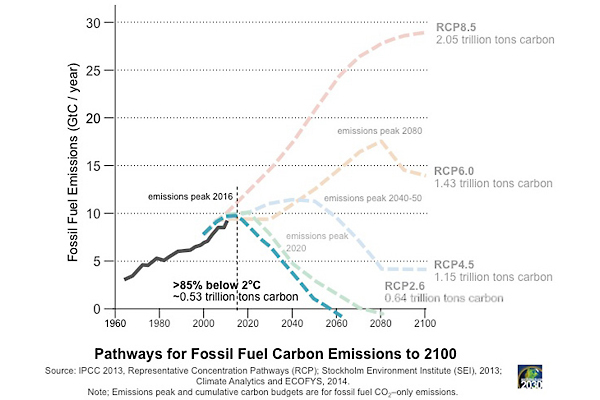 There are two main ways we can achieve carbon neutrality by 2050 (see the Ecofys working paper Feasibility of GHG emissions phase-out by mid-century). One is based on 100 per cent renewable energy – utilising energy efficiency at scale to reduce energy demand, and simultaneously decentralising and decarbonising power generation and transmission so renewables can make a stable contribution. The second way is with a high share of renewables but using technologies that result in ‘negative emissions’. This concept has emerged recently to describe the possible use of bio-energy with carbon capture and storage (BECCS) to produce negative carbon dioxide emissions by combining biomass use with geologic carbon capture and storage (CCS). In lay terms, crops absorb carbon dioxide as they grow. When burned in a power station, the resulting carbon dioxide is captured and then buried in wells, mines or geologic formations underground or under the sea. Electricity generation using BECCS then becomes a net absorber of CO2 rather than a net emitter. In theory, achieving carbon neutrality could be easier if CCS and BECCS could be scaled up cost-effectively. But in real life there are very few projects that show this to be the case. The enormous amount of land and water needed to grow crops to burn could also worsen food and water security, especially for the world’s poor – adding to climate injustice. Will achieving carbon neutrality cost a lot of money? Putting the world on a carbon neutral pathway will cost money, but not as much as the benefits it brings. The IPCC warns that the longer we delay, the greater the level of resulting warming. Every degree of warming equates to more risk, especially for the poor and most vulnerable. Deferring mitigation pushes the costs up and that is bad economics for everyone. The IPCC reports also warn that economic models are not very good at capturing the full range of impacts. For example, climate action produces significant ‘co-benefits’, such as reducing air pollution that contributes to around 3.7 million deaths each year – this is not taken into account in mitigation costs analyses (see the IPCC report Climate Change 2014: Impacts, Adaptation, and Vulnerability). Economic models also do not apply a climate justice lens. The costs of mitigation action and the costs of inaction (i.e. impacts from climate change) are not borne by everyone equally. Climate impacts will hit poorest people the hardest. In the real world, human beings and sovereign states have rights that cannot be ‘traded off’ as is done in economic models. It is not appropriate to put their loss of life, diminished human rights and threats to sovereignty on the same footing as potential economic losses by major carbon-emitting countries and polluters. Yet in climate policy circles, the existential threat faced by poor people and vulnerable countries is often put on a par with the existential challenge of carbon-intensive business models. Countries that are currently carbon intensive have far more resources, and therefore choices. They must face up to the need to develop new business models as part of the challenge of the world going carbon neutral. One route that could solve climate change and contribute to climate justice might be to impose a mandatory duty to increase access to 100 per cent renewable energy on all major energy providers, focusing on the 1.3 billion people in the world today who lack access to modern energy. What's your advice for individuals who want to become carbon neutral? Go for it! Lots of wonderful apps and online calculators already exist to identify the carbon footprint for the journeys we make, the food we eat, and the events we attend or organise. Using these tools makes you realise that there is a lot you can do already to bring down emissions. But it also makes you realise the limits of what an individual can do! So don’t forget to push climate leadership in whatever way you can. Last week I attended a meeting in North London where local residents discussed how to set up a community energy company (everyone invests a small amount of money and the company buys solar panels and installs them on roofs, generating local jobs and tackling fuel poverty along the way). But these initiatives need stronger national and international climate policies to help them thrive. My advice is to also give your leaders and ministers a gentle nudge to become carbon-neutral champions, and adopt policies to help make the transition to that world easier, fun and more just. Farhana Yamin is a leading international environmental lawyer and climate change and development policy expert. She has provided legal and policy advice to many different countries and constituencies over the last 20 years working as an adviser to developing countries especially the Alliance of Small Island States and least developed countries. She is a visiting professor at University College London, teaching international environmental law and climate change policy and an Associate Fellow at Chatham House.